Our new release of CloudAhoy enables you to specify your fixed-wing plane’s V-speeds. The main benefit of doing so is for aircraft with “unusual” characteristics, such as vintage aircraft, “one-offs”, very fast planes, etc. In those cases you can enter the V-speeds, and CloudAhoy analysis will be more accurate. Last week Rob Waring was flying four traffic patterns in his 1939 Aeronca Chief, a relatively slow tail dragger. Not knowing the plane’s V-speeds, CloudAhoy calculated them, over-estimated Vs (stall speed) by 10 knots, and labeled most of the flight as an “unknown flight op” since parts of it were below stall speed – see 1 below. By specifying the Aeronca Chief’s V-speeds, CloudAhoy provided Rob with an accurate analysis – see 2 below. For safe flying, every pilot of a fixed-wing aircraft needs to know the plane’s V-speeds. 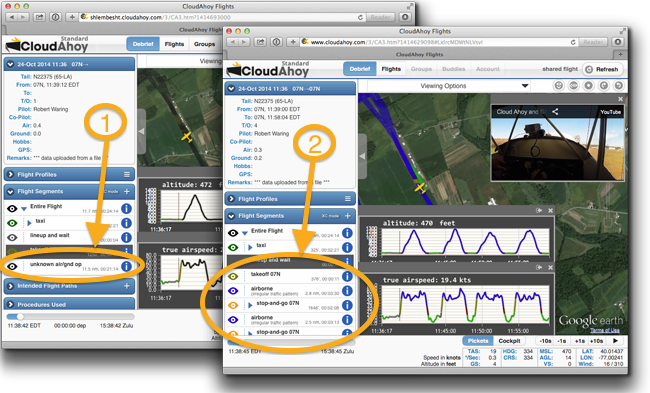 Likewise, to analyze and evaluate the flight, CloudAhoy needs to know the V-speeds. Until now, CloudAhoy estimated the V-speeds automatically from the flight envelop. This works well most of the time, but there are end-cases, such as very slow or very fast planes, in which CloudAhoy’s estimates might be off. The new feature enables you to increase CloudAhoy’s accuracy by explicitly providing the V-speeds. CloudAhoy has a “system” V-speed defined for several common aircraft types. If you fly a US or a Canadian aircraft, CloudAhoy will look up the tail number in the registry, determine the type and apply the “system” V-speeds if known rather than estimate the V-speeds. Over time CloudAhoy will have system V-speeds defined for more and more aircrafts types. 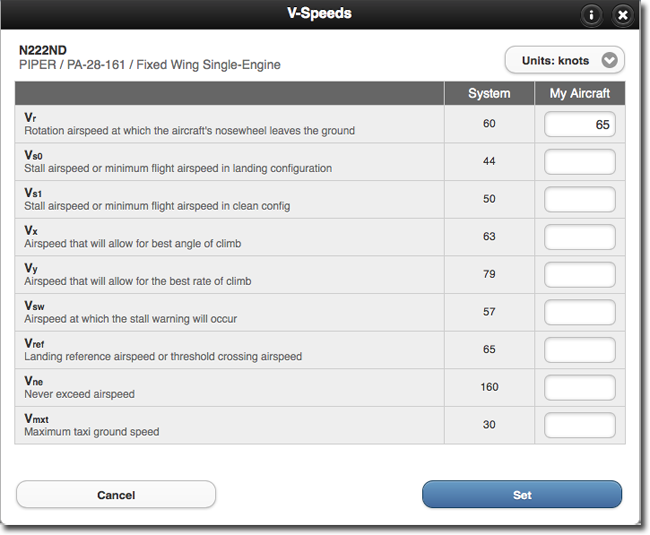 You can enter your plane’s V-speeds in the “My Aircraft” section of the Account tab. The example below shows how a user is overriding Vr. Should you enter V-speed numbers? In most cases, you don’t need to enter V-speeds – although it never hurts. If you don’t enter V-speed numbers, CloudAhoy will typically analyze your flights correctly by either estimating the V-speeds, or by using the “system” V-speeds for your aircraft type. There are no “system” V-speeds available for your make/type aircraft, and it seems that CloudAhoy has made some errors in analyzing the flight – for example, it incorrectly labeled a section of the flight as “stall”. You can override any of the “system” V-speeds. Note that entering V-speeds affects only the analysis of your flights. It does not affect other pilots, even if they fly the same identical plane. If your plane type does not have a “system” V-speeds and you have entered standard V-speeds for it, please send us an email (dev@cloudahoy.com). It would help other pilots flying the same make/type.